I feel very fortunate to have the opportunity to work with small business owners all over the globe. I love learning about different fields of business and my clients' place in their specific community and area of the world. But, I have to say, there's always something special about working with someone who is building a business in Minnesota. We have a thriving community of entrepreneurs here. It's such a pleasure to help heart-centered, happy and lovely Midwesterners elevate their visual brands and give them confidence in their own marketing. Collaborating with Winnie Lu on their new visual brand was extra special. Although owner Patricia Sjulson and I originally connected online via the Savvy Business Owners Facebook Group (she reached out to the group for branding designer recommendations for her new Minnnesota-based lifestyle store), I feel like I've known her forever. She is genuine and passionate, thinks about the big picture AND the details, and she's the kind of person you're just so happy to know. She is an inspiring brick and mortar shop owner and I know I'll be supporting her and Winnie Lu -- both as a friend and fellow business owner -- for years to come. From our very first conversation, I knew Allison was the perfect fit for me and my business. We connected immediately (I never even considered going with anyone else! ), she is professional, and she connects with her clients on a personal level, which made me feel super comfortable and excited throughout our time together. It truly felt like the perfect collaboration and my new professionally designed visual brand has set me up for success for years to come. Allison is professional yet always sweet and friendly, and she will be your biggest cheerleader... I wish she could handle every aspect of my new business! Winnie Lu is a Minnesota lifestyle boutique specializing in home decor and gifts with a vintage and rustic touch. Whether you're looking for a cozy blanket to cuddle up in front of the bonfire, or maybe the perfect glasses to serve your favorite cocktails on the back deck, you can expect to find it at Winnie Lu. We carry products that reflect the Minnesota lifestyle; think plaid blankets, scented candles, and rustic inspired decor, and we love to discover the very best in Minnesota made products. Our top priority is to find the best and most unique products that are available, and we always strive to make each and every customer happy and stress free! In addition to having a storefront, Patricia also wanted to have an online store component to her business. She was ready to go with Shopify when we first got in touch, so we moved forward with a full branding design that would give her flexibility to not only help her physical store come to life, but also her online store when she set out to build her site herself (so awesome!). When it came to Patricia's vision for her visual brand, she wanted something clean, traditional, and sophisticated, yet with a cozy Minnesotan flair. She imagined the inside of her store being mostly white with neutral and natural colors and textures, to allow the products stand out. Although she was still looking for a storefront space when we started working together, Patricia was on the hunt for something with character and she wanted to have a little rustic feel show through the design side of things too. To provide quality and unique products to our customers in a warm, comfortable, and friendly shopping atmosphere. "I'm most passionate about creating a store that feels comfortable and inviting to everyone. I want customers to walk into the store and instantly fall in love, feel at home, and never want to leave. Like they walk in and can just exhale all the stress away!" She wants her customer experience to be a small town feeling when they walk into her store. Even if they don't find something to purchase, she wants them to love the experience enough to keep coming back. "That feeling when you walk into a store and they know your name, what you've bought before, they ask about your family, etc. My customers will always shop in a warm and inviting atmosphere that's filled with products specifically tailored to the Minnesotan lifestyle -- warm and cozy blankets, pillows, candles, and vintage/rustic goods just to name a few. Customers can always find something unique at Winnie Lu and we search high and low for things you can't find anywhere else." Customers of Winnie Lu are mostly women ages 24+, mother's, daughters, newlyweds, grandparents, etc. They all share a passion for creating a positive home environment for their families, prefer to shop local boutiques over big box stores, and have a passion for giving and community involvement. "They may work from home, work in a corporate office, or may be a stay at home mom/wife, but each of them put their loved ones before anything else. They spend time with each other, love a good cup of coffee, and tend to prefer a nice glass of wine and good conversation at home over a fancy date night out." As far as style goes, Winnie Lu's customers love brands that aren't too trendy. They are a true Minnesotan at heart and love exploring the outdoors year-round, and their style reflects this. "She definitely has both a plaid and denim shirt in her closet. She'd prefer to be in boyfriend jeans and a tee-shirt over a fancy dress! She appreciates brands like Anthropologie, Faribault Mill Wools, Loft, J Crew, Barbour, and Joules. However, she shops at local boutiques in the towns she visits and overall, prefers brands that are more traditional or unique." what makes winnie lu unique? They have a mix of old and new products, vintage and traditional, all together in one store. The owner will be in the store every single day to build a relationship with customers and continue to learn the needs of everyone shopping. Can you see it?! Can you imagine her target customer?! I certainly could. Patricia's Branding Workbook was incredibly helpful as we dived into creating a visual brand that not only suited her but also would attract the right customers. As a part of my brand discovery and inspiration gathering process, I also had Patricia collect visual inspiration on Pinterest... images that represented her vision, her customer's lifestyle, textures and patterns that felt good to her, typography she loves, etc. From there, I created a mood board and color palette to give us a visual direction for Winnie Lu's visual brand. The mood board feels light, airy and clean, while having rustic and vintage undertones too. Although routed in neutrals (brown, taupe, ivory), Patricia also loved the idea of using navy as a grounding color and I did too! I also added in a soft yellow that brings a nice subtle warmth, energy and happiness to the palette... that addition is unique, I think, and makes Winnie Lu stand apart from other brands with the rustic look. After finalizing the mood board and color palette, we moved on to logo concepts. "Simple, classic and timeless" is always my motto and reflects my aesthetic in the visual branding realm (and why Patricia said she was attracted to my work in the first place!) and although Winnie Lu's brand was no exception to this, it was perhaps even more important to stay true to that here. Not only would Winnie Lu's logo appear on their website and on business cards, but also on their storefront sign, product tags, and beyond. It needed to be versatile and clean, communicating their personality in a clear way. On first glance at her storefront, her target customer should be intrigued and think, "I need to stop in there!" I designed three logo concepts along with a logo variation, watermark and other submarks for each, so Patricia could see how each concept would "build out" into a full visual identity. Each concept has a distinct personality -- the first is more on the rustic side of things, the second is more modern with a personal touch of the handwritten font, and the third has more of a "throwback" feel that is bolder than the others but still clean and simple. Patricia was experimenting with different taglines at this time, so I incorporated the two she was considering to give her a visual of how each would look within the design. After Patricia provided her always thoughtful feedback, her likes and dislikes, and where her mind was at, we decided to go in the direction of the first concept. We brought in a similar yet more classic and traditional serif font for the first concept, but kept the basic structure of the logo and marks the same. She also loved the "Minnesota made" mark from the second concept, so we incorporated that and decided to also use the handwritten front as an accent throughout her branding. It really contrasts well with the more structured serif font in the logo, adding a personal touch. "Minnesota Lifestyle Boutique" was the final tagline selection, so we incorporated that as well! After playing with color and expanding Winnie Lu's design to include patterns, textures and web icons, we soon had a full brand styling complete. I'm so happy with how it all turned out -- it is not only gorgeous and timeless, but also feels comfortable and makes me feel "at home" when I look at it. I have a feeling Winnie Lu's customers will feel the same way! What do you think?! The patterns and textures are one of my favorite aspects of this visual brand. The plaid texture/pattern is especially a highlight for me -- I wanted to create something that tied back to the plaid shirt, "up north," trendy but casual vibe that would resonate with Patricia's customers. Although it's not traditional red and black lumberjack plaid, it's a classier version of that and suits Winnie Lu perfectly. A fun background to use on her social media imagery, flyers (we are using it on her grand opening flyer actually! ), and beyond. The navy watermark pattern is a great go-to as well, for more of a classic and clean background. It allowed us to play with reversing the logo on top of it in white, which looks so lovely (we went this direction for her business cards, as you'll see below). The web icons represent not only the different types of products Winnie Lu sells, but their values as well -- high quality and unique gifts, items for the home, and Minnesota-made products, all provided in a store that has a huge heart and passion for serving their customers. They are simple and clean in nature, with a very subtle textured outline, giving them that slightly "imperfect" and casual feel, which contrasts nicely with the clean logos and marks. After the visual branding was finalized, we moved on to the last phase of the project -- implementation, aka designing print materials and social media imagery! We created beautiful business cards for Winnie Lu, which I'm definitely and full heartedly, 100% in love with. I love how we used the watermark pattern for the back and went so clean and simple on the front. Hello white space! This designer has all the heart eyes over here. In lieu of stationery, we decided to create a grand opening flyer for Patricia to help get the word out about Winnie Lu and their big opening day. I'm dying to show you all this flyer (it is so dang cute!) but because the exact date of the opening still needs to be finalized, I'm practicing self control and will reveal it once it's completely ready. I also designed a fun postcard invitation to Winnie Lu's soft launch and private event for family and friends... stay tuned for a peek at all of that soon! 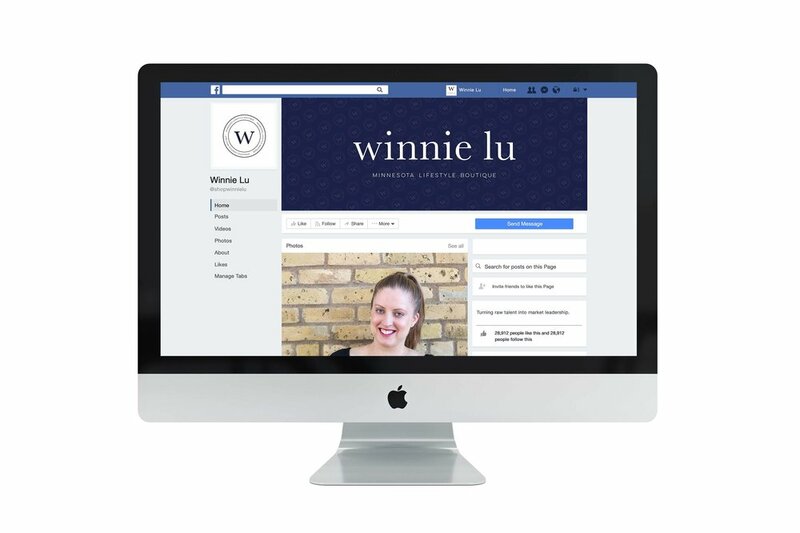 For social media imagery, I created a set of what I call "brand launch imagery," designed to help celebrate Winnie Lu's opening, draw attention to the launch, and encourage people to visit the store. Imagery for that "campaign" of sorts included a Facebook page design, Instagram image, newsletter banner image and Pinterest image (used to direct people back to her website). I also designed two additional Facebook designs to use when it's time to switch things up on her business page. Since we wrapped up Winnie Lu's visual branding, it's been fun to keep up with them on Instagram and follow along on Patricia's journey as she gets her space ready, starts collecting products, reaches out to Minnesota based artists and national brands as well. There is SO much that goes into this process of opening a store -- I'm sure I don't know the half of it! -- but there is no doubt that Patricia's store will be beyond beautiful. I'm thrilled that I had the chance to collaborate with her and design the brand of her dreams so she could feel confident, excited and fully ready to make her dream of opening a store a reality. Images from Winnie Lu's Instagram. Follow them here! I am so so so excited for Winnie Lu to open their store -- I will be there with bells on! If you live in the Twin Cities area, you should too :) I'll continue to update you here and on Instagram when a final opening dates has been announced... I'll be waiting not-so-patiently! Visit the Winnie Lu website!